The International Geophysical Year – or, to be exact, the International Geophysical Year and a Half (it ran from 1 July 1957 to 31 December 1958) – was an international collaboration that encompassed 67 countries and included such moments as the launch of Sputnik 1, and long-lasting impacts such as the drafting of the Antarctic Treaty. 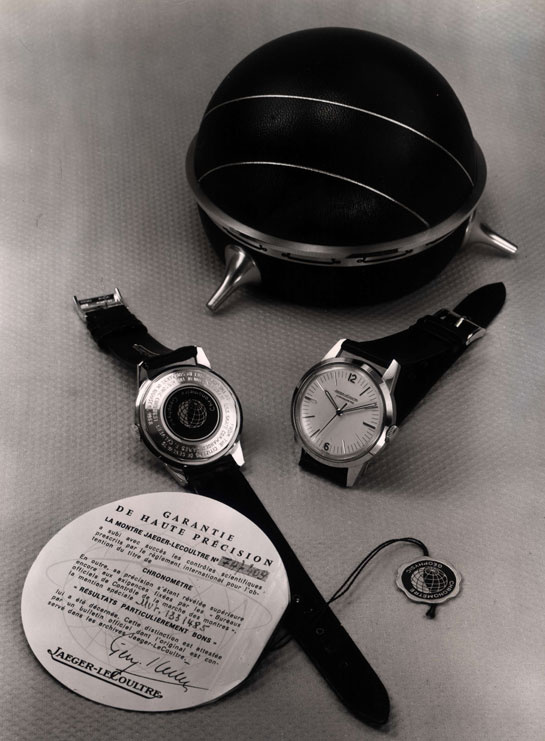 However, it was Operation Sunshine, the first successful submerged voyage from the Pacific to the Atlantic Ocean, via the North Pole, that Jaeger-LeCoultre honoured with its Géophysic watch in 1958. The U.S.S. Nautilus, named for Captain Nemo’s vessel in 20,000 Leagues Under the Sea, was the United States’ first operational nuclear-powered submarine. In response to the intercontinental threat posed by the newly launched Sputnik 1 satellite, Eisenhower ordered a top secret mission, Operation Sunshine. After two potentially disastrous attempts during ’57 and early ’58, Nautilus reached 90° North at 2315 EDT on August 3, 1958. It has been reported that fewer than twenty men (outside of the 116 sailors and civilian scientists and navigational technicians onboard) knew of the mission. The ability to navigate at extreme latitudes and without surfacing was enabled by the technology of the North American Aviation N6A-1 Inertial Navigation System, a naval modification of the N6A used in the Navaho cruise missile. Having successfully completed the mission, she sailed to the Isle of Portland, from where she started her journey back to the United States and a hero’s welcome. She had, effectively, sailed the Northwest Passage – a feat that had eluded explorers until then. Nine days after the Nautilus reached the Pole, her sister nuclear submarine USS Skate also completed the journey. The Skate surfaced at the Pole in March 1959, the first time that had happened. While the public – and the people of Geneva – were excited by the journey’s sense of adventure, the real value was in showing the USSR that the US was capable of putting submarines within range of their borders, under the cover of ice. 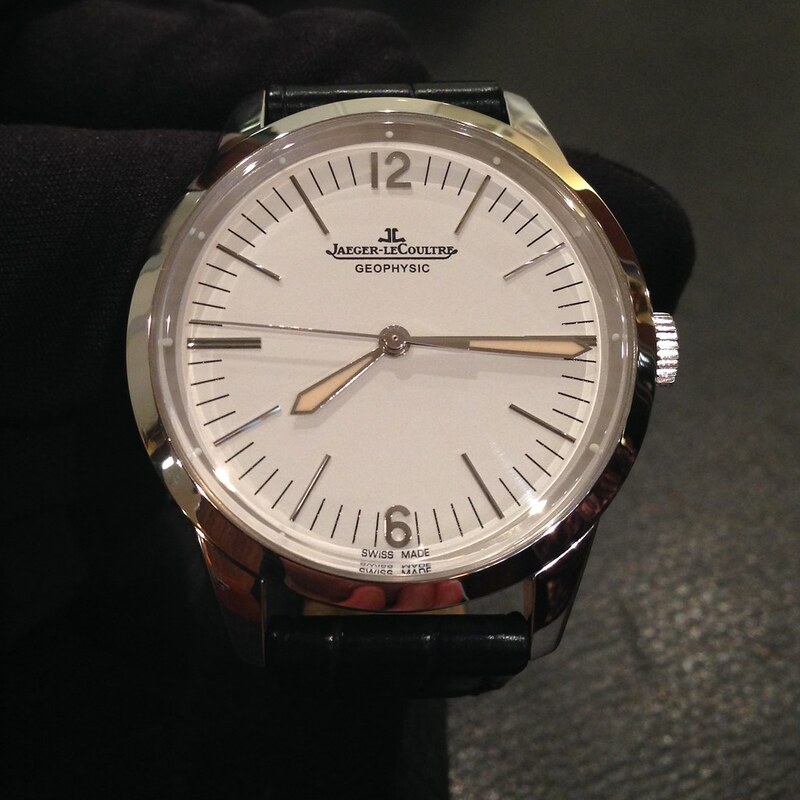 Last June, in the year following their 175th anniversary, I was invited to attend the London launch of Jaeger-LeCoultre’s reissue of the Géophysic, and had the opportunity to take a closer look at the original. As you can see, it’s a very handsome piece indeed, a little small by today’s standards at only 35mm or so (incidentally, about the same size as a JLC Mark XI or Smiths W10, both of which also had a soft iron cover to protect from magnetism) with applied batons, sword hands and the word “Chronomètre” as the only adornments to the relatively simple dial. This is predominantly a tool watch designed for the scientific community – although, as with so many Jaeger-LeCoultre watches of that period, they did seem to find it almost effortlessly easy to design practical yet truly elegant watches. There were two key references, the E168 8067 and 8068; however, there was a third dial variant, with a distinctive cross-hair dial, the reference 8085 as seen below. The new Geophysic® 1958 is 38.5mm and sports the Calibre 898/1, an automatic movement with ceramic bearings. The Cal 898/1 is based on the autotractor-ised ultra-thin 899, and is just 3.3mm thick; it has SPYR gears (i.e. the teeth are more rounded to reduce friction and maintain more even torque (as used in the JLC Mechaquartz) and ceramic bearings. Of course, the movement has also passed the 1,000 Hours Control. As you can see from the photos below, there are two dial variations, both with sword hands and applied batons. Small hemispherical spots of Super-LumiNova are dotted along the rehaut and a “vintage look” has been applied to the Super-LumiNova on the hands. Available in steel (above) and rose gold with the 3-6-9-12 crosshair dial, and in platinum with the classic dial (below), these watches were released in limited numbers last year (available from Jaeger-LeCoultre’s E-Boutique, starting at £6,350). 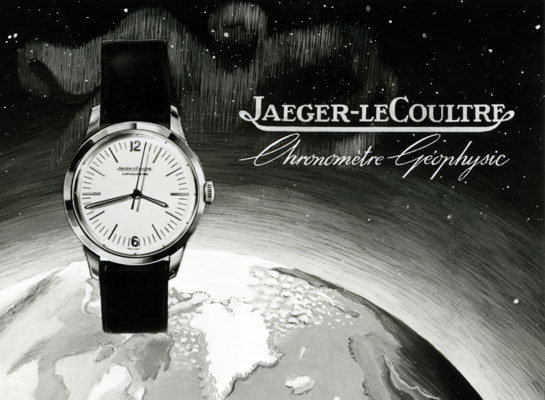 It’s interesting to note that not only has Jaeger-LeCoultre registered Geophysic® but also started to refer to the Geophysic® Classic range. This latter description suggests more is to come, although the original watch was limited to just one reference with three models (unless there’s a DeLuxe version on the way?). 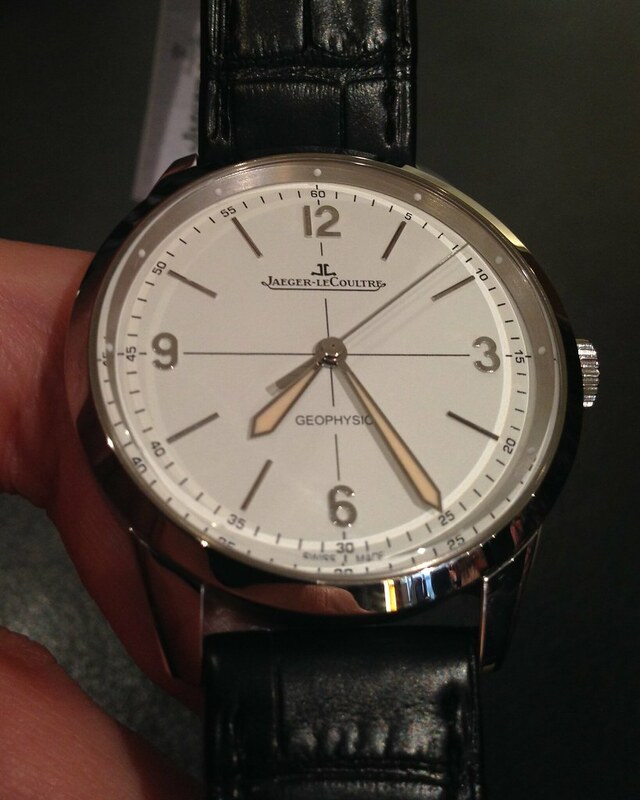 The Geophysic® 1958 is a rather nice reissue of a watch that was important to Jaeger-LeCoultre (one of their very few “chronomètre” movements), as well as being sort after and rather rare. One wonders whether there might be other, similarly sensitive reissues on the way, perhaps the Chronomètre Géomatic, Polaris II or Master Mariner Diver watches. Crumbs, just think of the fun you could have with a modern Mark XI. 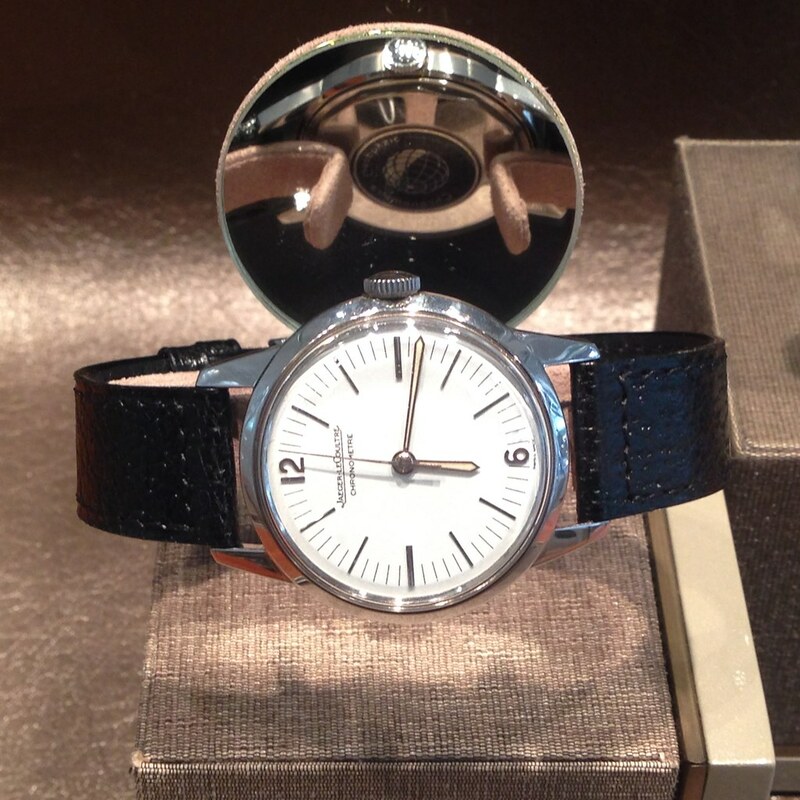 Disclosure: I was the guest of JLC’s London Boutique and QP Magazine. No travel was provided. Canapés and alcoholic beverages were provided. A gift bag included a set of JLC cufflinks, a copy of QP Magazine, and JLC’s Seven book.